Milestone reached: 1031 new MCA accounts per day! Dukascopy Bank is proud to inform that the next key milestone of MCA and Dukascoin projects has been passed: more than 1 000 new MCA accounts have been opened on Tuesday, April 23, 2019. Only one week ago we celebrated substantial progress of clients&apos; onboarding figures, and we did it again! This fact is the vivid evidence of the accuracy of the bank&apos;s plans developed more than a year ago. We can only refer to the Dukascoin Whitepaper, “the Bank started to offer MCA accounts for its clients one year before the launch of the Dukascoin project (February 28, 2019). In the beginning, the number of new MCA accounts per day was about 10. In 5 months it had reached about 50. Ten months after the launch of MCA accounts, the Bank was opening 100 new accounts per day. With the help of the Dukascoin Crypto ICO, the Bank is planning to open from 1000 to 10000+ MCA accounts on a daily basis. With the trend continuing to be so dynamic, the Bank is eager to become the biggest digital bank regulated in Switzerland. The Dukascoin will be the instrument of this expansion.” Today we would like to stress that those 1000 accounts per day which have been set as far away milestone is reached very soon. Currently, despite some scepticism from the side of market participants regarding the concept of airdrop emission, Dukascoin has secured a stable exchange rate of around 0.75 EUR per 1 DUK+ during the month and a half. Such market evaluation ensures the progressive ongoing development of the project. A couple of dozens of clients have already allocated their Dukascoins with our Coin and EUR reward programs. And the elite club of Dukascoin holders called Fat Catz has already hailed its first members. The future perspectives look bright, and we confidently declare that our retail banking and crypto projects fully match the initial road map while keeping up the positive dynamics! Starting Monday 29 April, several Japanese holidays are observed, the Golden week. For CADJPY, CHFJPY, EURJPY, GBPJPY, HKDJPY, SGDJPY, TRYJPY, USDJPY and ZARJPY an 11-day Swap to value 7 May will be applied at the end of day settlement on Wednesday 24 April. At settlement on 25 April a one day Swap will be applied. There will be a total of six days without swaps until settlement on 6 May when a normal 1-day swap will be applied again. For AUDJPY and NZDJPY: An 11-day Swap was applied at settlement on 23 April. There will be no swaps on 24 April and a one day swap on Settlement of 25 April. Same as the other instruments, there will be no further swaps until settlement of 6 May. Please beware that liquidity for JPY instruments may be poor and price spreads larger than normal due to the absence of many Japanese traders. The detailed market closures can be found here. Several markets will be closed on the upcoming Easter weekend. The trading schedules for FX, Bullion and CFD markets can be found here. Firstly, MCA account holders who didn`t benefit from the MCA promotional program (didn`t get 5 EUR after an MCA account opening before 28/02/2019) will receive five Dukascoins. The distribution will be performed during the nearest term. Dukascoins will be credited to MCA account balances automatically. Clients don`t need to undertake any action. The second option is intended for MCA account holders and their Referrers who had received 5 EUR pursuant to the MCA promotional program before 28/02/2019. Despite the current market price of DUK+ fluctuating around 0.75 EUR per coin, Dukascopy Bank is following its obligations revealed in the Dukascoin Whitepaper and is offering the possibility to buy 5 Dukascoins at the price of 5 EUR during a period of 30 days starting from the day of this announcement. Clients willing to realize their right during the above mentioned term are invited to send an individual request to [email protected] with their MCA account details and phone numbers for further processing. After completion of the DUK+ distribution for MCA accounts opened before 28/02/2019 the bank is happy to announce that all activities according to the Dukascoin Whitepaper regarding initial coin distribution have been fulfilled. Further regular Dukascoin distribution will be performed according the Rules published here. This concept was developed by the bank to guarantee deficit of Dukascoins in circulations. The amount of Dukascoins will always be linked to the number of MCA accounts opened and consequently the number of clients who underwent the strict identification procedures. We congratulate all clients of Dukascopy Bank with the completion of the initial stage of the Duksacoin Airdrop ICO launch! 797 new MCA accounts per day? Done! Dukascopy Bank is proud to inform that last record benchmark of daily MCA accounts openings has been overcame just in two days! The new benchmark has been set yesterday – 797 clients started to enjoy all benefits created by Swiss bank to regular retail customers: state-of-the-art mobile banking, reliable messenger, usage of cryptotokens and Swiss regulated client funds protection. Our forecasts regrading high demand to quality banking service strengthened by the unique combination of simplified Video Identification during client onboarding and opportunity to step into contemporary crypto world with Dukascoin live up to expectations. We consider that the first global milestone for our bank of 1000 daily MCA accounts openings is not long in coming and will be reached till the end of the spring. Stay tuned! Dukascopy Bank is pleased to notify our clients that first Dukascoins holder with large balance has joined the elite group of members of our crypto-community called Fat Catz. As for today this client has a unique opportunity to get an annualized reward equal to 129.84% in EUR at the end of April! Dukascopy Bank would like to remind: members of Dukascoins Fat Catz club are participating in monthly distribution of 1% of commission charged by Dukascopy Bank for operations on Dukascoins marketplace. Any client with the balance of MCA account equal to or larger than 10 000 DUK+ is eligible to join Fat Catz club. The commission will be distributed proportionally to the amount of Dukascoins held on Fat Catz account. NEW BENCHMARK HAS BEEN SET: 778 NEW MCA ACCOUNTS PER DAY! Dukascopy Bank is happy to notify clients and readers that in less than one month new record mark of daily MCA account registrations has been set on April 8. Just on March 13 we reported about the fact that 727 new clients joined our family of satisfied MCA account holders during only one day! Today we are celebrating new benchmark – 778 new accounts per day! We would like to remind that the average daily number of registrations of the new MCA accounts has doubled every quarter. We are happy to state that the dynamic stays positive and we are looking at future with great confidence. The trust of all our clients and prospects relying on our services builds solid foundation of the development of retail wing of Dukascopy Bank business! Stay tuned! Dukascopy Bank launches a second level of referral program called Big Fish. It is based on the same referral code used for the existing referral program while opening mobile current accounts (MCA). Big Fish program introduces a new additional bonus of 100 DUK+ paid to the referrer of each MCA client who`s account reaches 10 000+ Dukascoins. The Amount of Reward Deposits (if any) is counted. The Big Fish bonus is paid in addition to the standard 5 DUK+ referral bonus. More details about Referral Program for existing clients can be found here. Dukascoin FAT CATZ club is open! Dukascopy Bank is pleased to announce that Dukascoin Fat Catz club opens its doors. The bank reminds that the members of this prestigious club will share the commission collected by the bank from all other Dukascoin holders exchange operations. The bank charges 1% from each transaction on Dukascoin marketplace. This commission is collected and distributed among Fat Catz club members. To become the club member, one has to accumulate 10 000+ Dukascoins. To the attention of prospect investors, the calculated annualized return in March was around 74%. We are happy to invite our clients to visit the Dukascoin Fat Catz club web page via the link and get more details of how to profit from being a member of Dukascoin holders elite. Convert currencies at lower rates on your MCA account! Currency exchange has become even more pleasant and advantageous than before - Dukascopy Bank is lowering the commission for the conversion of any of its 23 available currencies. The new spreads are now only 0.5% above the interbank exchange rates. Remember that Swiss residents enjoy an additional 50% discount from the standard fees. To benefit from our favourable conditions, simply log in to your MCA account! If you do not have an account yet, you may always apply for one by downloading our mobile app Dukascopy Connect 911 from Google Play or Apple Store and visiting the 'Bank' section of the app. Other fees can be found on the MCA account web site. Due to high demand from investors, Dukascopy Bank has decided to prolong exceptional proposal for EUR Reward for Dukascoins 1 year deposits. Starting from April 1, 2019 monthly minimum deposit requirements will become 2000 Dukascoins. We remind that according to this program Dukascopy Bank pays 50 euro cents for each deposited Dukascoin for period of 1 year. Detailed EUR Reward program conditions are available for Dukascopy Bank clients here. Due to the situation around the liquidity crisis of the Turkish Lira and the associated risks, Dukascopy Group decided to temporarily reduce the maximum exposure amount on TRY pairs from 15 to 1 million of primary currency on all trading accounts. Overnight rates on Turkish Lira instruments were adjusted to reflect the current market conditions while the leverage remains unchanged at 1:10. This measure has been introduced today and will be in force until further notice. 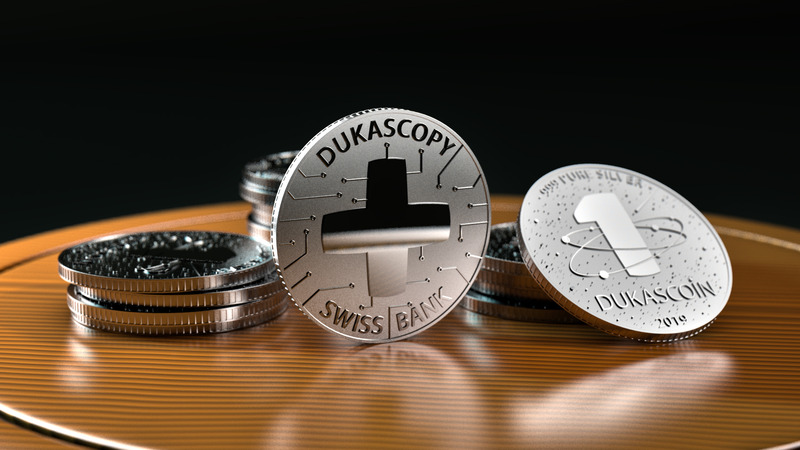 For clients who have more than 1000 Dukascoins on their MCA account balance and want to marvel their friends and business partners by an exclusive souvenir, Dukascopy Bank offers a unique opportunity to order Silver Dukascoin! The physical coin will bear a valuation of 10 EUR worth of actual silver metal at the moment of order. A limited number of 1000 Silver Dukascoins will be offered to clients with a maximum allocation rule of just 1 Silver Dukascoin per account holder. Clients who own no less than 1000 Dukascoins on their MCA account or had placed a relevant amount to one of the reward programs offered (Coin or EUR reward) at the moment of the order of the Silver Dukascoin are invited to join current unique opportunity. Each Silver Dukascoin souvenir box will consist of the coin itself and numbered Certificate of Origin signed by CEO of the Dukascopy Bank personally. The Bank guarantees that the number of Silver Dukascoins will be strictly limited by the amount of 1000. Thus the Silver Dukascoin will become the real sign of your exclusivity. The dimension of the coin would be 33 mm x 2,5 mm. The design of the coin is approved. Please, press this link to evaluate your souvenir. The price of the Silver Dukascoin is 20 DUK+. This amount of DUK+ and shipping costs will be charged in terms of fiat and crypto from the respective MCA account holder balance. As an option, the holder can store the Silver Dukascoin in the Dukascopy Bank vault free of charge without paying shipping costs. The Client can either pick-up the Silver Dukascoin personally or request the shipping later. In case of shipping order, the cost of shipping will be charged from the balance of the respective MCA account. Currently, clients who wish to buy Silver Dukascoins are invited to send a request to [email protected] indicating their MCA account and/or phone number. The special-order form of Silver Dukascoin will be developed and disposed on the www.dukascoin.com website. Dukascopy Bank is going to offer a limited set of Gold Dukascoins later. Conditions of the order and design will be published soon. Dukascopy keeps its promises and launches 3 new soft commodities (Coffee, Cotton, Orange Juice) as it was announced on the 26th of February 2019. At Dukascopy Bank the maximum leverage is 1:30 for the new commodities, for Dukascopy Europe account holders a leverage of 1:10 is applied. Dukascopy continuously expands its list of trading instruments to meet customer's requests. Due to a dramatic increase in the demand for MCA account services and access to our new cryptocurrency from the side of legal entities, Dukascopy Bank has decided to open the Dukascoin airdrop to this category of customers. We would like to remind everyone that earlier legal entities had only two options for obtaining Dukascoins: either to become a Referrer and get Dukascoins for new MCA account holders or to buy Dukasoins on our internal marketplace. Starting from next week legal entities which will open MCA accounts will get 5 Dukascoins for free. Thus, all clients who will open an MCA account will be eligible to participate in the Dukascoin airdrop. 727 new MCA accounts per day! A new record mark is reached on March 13th. Dukascopy Bank is happy to notice all readers and clients that a record mark of the daily new MCA account registrations has been set on March 13th. 727 new clients joined our family of satisfied MCA account holders during only one day! We strongly believe that this mark will not hold long. According to our statistics the average daily number of registrations of the new MCA accounts has doubled every quarter. We see the tendency that every three months the number of daily registrations doubles. In January 2018 we had started from the shy average figure of 22 accounts per day. And in only one year our retail banking team has hit a new impressive peak! We really appreciate the trust of all our clients and prospects relying on our services! Stay tuned! After historical moment yesterday when the first Coin Reward deposit had been registered (see communication from 12.03.2019) Dukascopy Bank is pleased to notify about another historical event - first yearly deposit in Dukascoins with a Fiat Reward is registered! The amount of this first fiat rewarded deposit is 2000 Dukascoins and the yearly return for the lucky owner is 1000 EUR! According to the Fiat Reward program conditions the reward of 0.5 EUR for every Dukascoin deposited is paid at the beginning of the deposit term and is blocked until the expiration date. Dukascopy Bank congratulates the lucky holder of that deposit! This client managed to accumulate the amount deposited at the average exchange rate of 0.87 EUR for 1 Dukascoin. It means that the effective reward for the deposit is 57%. Bravo! The Bank would like to remind users that till the end of March 2019 the minimum required amount of the Fiat Reward deposit is reduced to only 1000 Dukascoins! Clients interested in this offer are advised to get a confirmation from Dukascopy Bank prior to acquire Dukascoins for this purpose since Dukascopy Bank has a discretionary right to limit its offer. Please, take a look at the detailed description of the program here. Dukascopy Bank is glad to notify that the first yearly deposit in Dukascoins is registered! The amount of the first deposit is 1024 Dukascoins and the yearly return for the lucky owner is 40% paid in Dukascoins. According to the program conditions the Coin Deposit Reward is paid at the beginning of the deposit term and is blocked until the term expiration. Dukascopy Bank congratulates the lucky holder of that first deposit with an opportunity to obtain Dukascoins at a current extremely lucrative exchange rate. The Bank would like to remind users that the return on a one year deposit is progressive up to 100% and significantly depends on the allocated amount. Please, take a look at the detailed description here. Clocks will be advanced by 1 hour this Sunday 10 March in the US eastern time zone (EST). The FX trading day ending at 5pm NY time and Dukascopy Market opening and settlement time will be changed from 22:00 GMT to 21:00 GMT effectively this Sunday 10 March 2019. Dukascopy settlement will return to Winter schedule on Sunday 3 November.